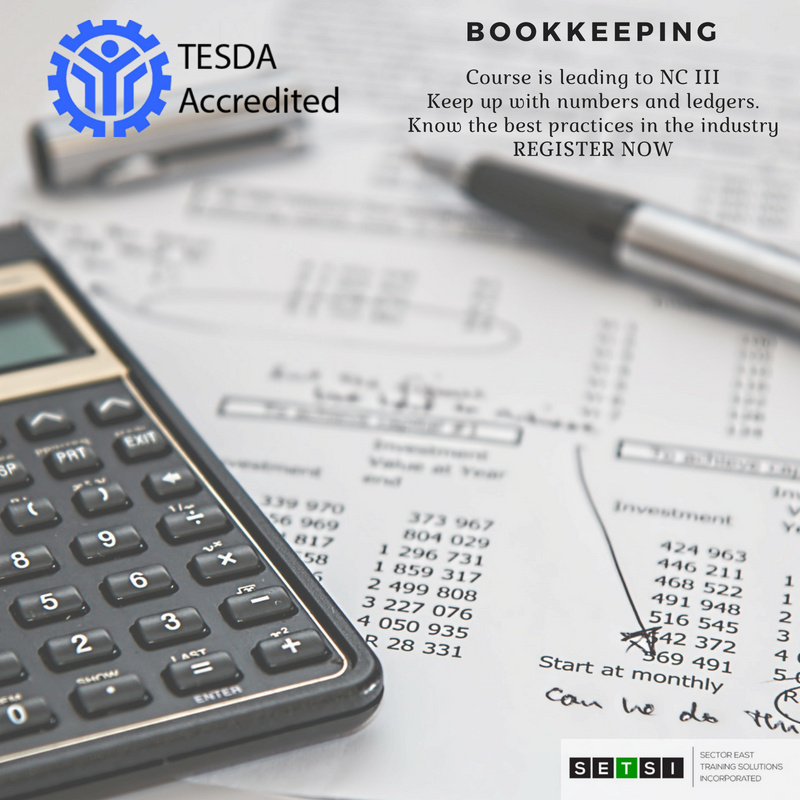 Sector East Training Solutions Inc. (SETSI) is a Technical Vocational Institution accredited by TESDA to offer TVET Programs for Bookkeeping NC III. Our school is located at Sta. Elena, Markina City. Business owners and anyone engaged in line item budgeting should should have the essential knowledge and skills in the following - journal entry, balancing spreadsheets, and the rudiments of debit and credit concept. 3. Must be able to record transactions in the appropriate ledger or journal based on the industry practice. 4. Must be able to balance of ledger accounts. 5. Must be able to prepare balance sheets and profit and loss statements. The demand for bookkeepers is high and on the rise. You have an excellent chance of gaining employment once you complete your qualification. Bookkeepers are wanted everywhere, so if it is your dream to work overseas, you should consider a career in bookkeeping. There are also a large variety of industries you can work in as a bookkeeper. Some individuals choose to stick to the world of finance but you can work in retail sectors, healthcare or insurance, the list is endless!